The Bible has touched millions of lives throughout history—male and female, adult and child, rich and poor, scholar and uneducated. No matter how long we've been Christ-followers, it's good to periodically remember the wonderful character of God's Word. Each day let's come to God asking to see new and wonderful things in His Word (Psalm 119:18). 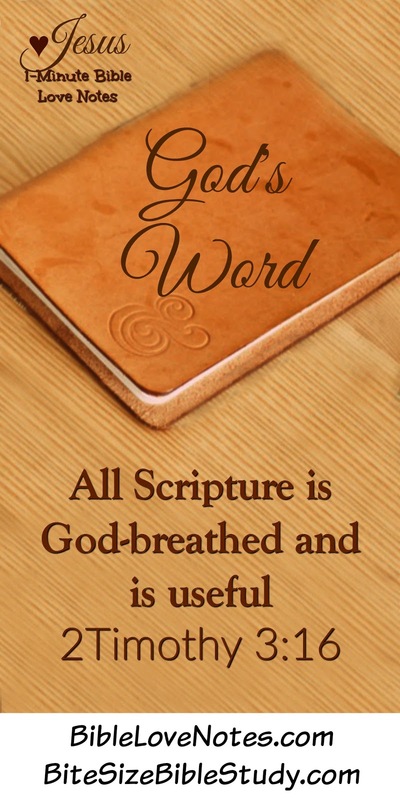 2Timothy 3:16-17: All Scripture is breathed out by God and profitable for teaching, for reproof, for correction, and for training in righteousness, 17 that the man of God may be complete, equipped for every good work. Matthew 4:4: Jesus answered, "It is written: 'Man shall not live on bread alone, but on every word that comes from the mouth of God.'" 3. Why is the Word so fitting a name for Christ? In what ways does this name help you better understand Christ and His Word? John 1: 1-5: In the beginning was the Word, and the Word was with God, and the Word was God. 2 He was in the beginning with God. 3 All things were made through him, and without him was not any thing made that was made. 4 In him was life, and the life was the light of men. 5 The light shines in the darkness, and the darkness has not overcome it. Colossians 2:1-3: For I want you to know how great a struggle I have for you and for those at Laodicea and for all who have not seen me face to face, 2 that their hearts may be encouraged, being knit together in love, to reach all the riches of full assurance of understanding and the knowledge of God's mystery, which is Christ, 3 in whom are hidden all the treasures of wisdom and knowledge. Hebrews 1:1,2: Long ago, at many times and in many ways, God spoke to our fathers by the prophets, 2 but in these last days he has spoken to us by his Son, whom he appointed the heir of all things, through whom also he created the world.